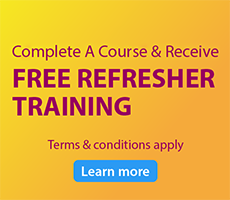 Customers can enjoy unlimited free refresher training after completing a course with Acadia Training. When a course is paid in full. For a period of 1 year from the date of course completion, e.g. a participant completes a course on 10 Jan 2018, the free refresher training benefit would end on 9 Jan 2019. When the course completed by a participant is free of charge. To a participant who had not completed a course with Acadia. To a participant whose training was sponsored by his former work organisation. Note: Unlimited free refresher training benefit is subjected to eligiblity. Acadia Training Pte Ltd reserves the right to amend the terms and conditions of unlimited free refresher training or to suspend or terminate the benefit at any time without any prior notice. In the event of inconsistency between these terms and conditions and any marketing or promotional materials relating to unlimited free refresher training, Acadia Training's decision shall prevail.